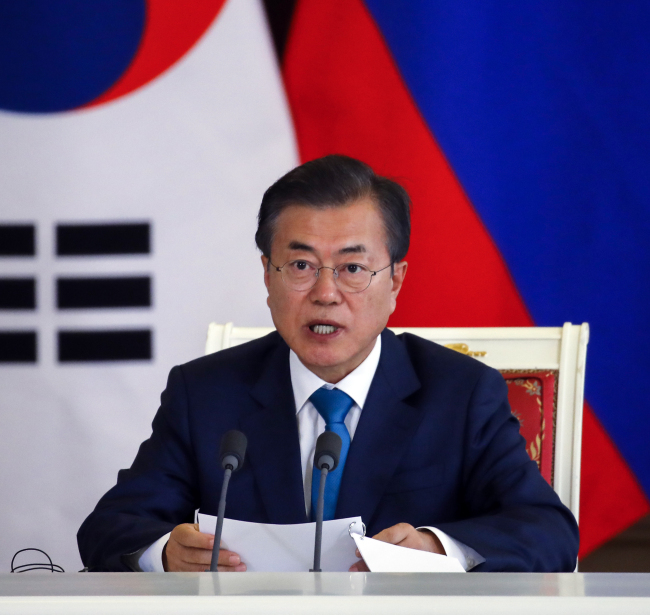 The government called off a scheduled meeting on deregulation at the last minute on Wednesday, prompting suspicions over the whereabouts of President Moon Jae-in who had been set to attend the meeting. The meeting was originally scheduled to be held at the presidential office Cheong Wa Dae from 3 p.m.
"Prime Minister Lee Nak-yon suggested the meeting be pushed back,"a Cheong Wa Dae official told reporters, noting the prime minister cited a lack of adequate preparations for the meeting designed to help speed up the lifting of excessive government regulations. "President Moon said he too felt frustrated," the official added. The last-minute delay, however, has prompted suspicions that a new priority may have emerged for the president, possibly a meeting with North Korean leader Kim Jong-un. Such suspicions follow Moon's second and previously unscheduled meeting with Kim on the North Korean side of the border village of Panmunjeom on May 26 that was disclosed only after Moon returned to South Korea. Moon and Kim first met on the South Korean side of Panmunjeom in a highly publicized and historic inter-Korean summit held April 27. Further raising suspicions that Moon may have been forced to call off the deregulation meeting, Cheong Wa Dae said the president's scheduled meeting with UNESCO Director-General Audrey Azoulay has also been called off due to what it called issues related to their schedule.